On Friday night, Prograis takes his 20-0 (17 KOs) record into the ring to face 22-1 (11 KOs) Julius Indongo. Prograis has his first world title in his sight and to say he’s focused on capturing it would be a gross understatement. Everyday I wake up with you on my mind. I need you to know my name. I fought through blood, sweat, and pain to become one of the greats. One of your greats. How will you remember me? Well, that story’s being written. As a kid from New Orleans, Louisiana, things weren’t easy for me. Rough is all I know. It’s crazy how a city that is so lively and beautiful could have such a dark side. But the dark side made me. The struggle helped build my character. It made me mentally strong. The streets of New Orleans gave me a tough edge that can’t be matched by anyone in the world. With every step I take towards the ring I become more dangerous, more focused. When I step into the ropes I bring my city with me. That’s when something deep within me takes complete control of my mind, and my body. I become a savage — a beast out for blood…I become The Rougarou. I’m writing this letter to introduce myself to you, world. It’s my time. A world title within reach. Let me be your champion. My promise to you is to work non-stop every single day. Outside the ring I’ll be the positive role model that our youth needs. And inside the ring I’ll be your warrior. You are more than fans. You are now Team Regis. Thank you in advance for riding with me. How great is that? Boxing needs this. A shot in the arm. Prograis has it all. The lefty is great on the mic. He enters the ring wearing a huge, horrific Rougarou mask. Then he backs it all up in the ring by bludgeoning opponents. He fights like the savages that came before him. His favorite fighters of all-time are Mike Tyson and Roberto Duran. You can see them in him. He is as tough as my favorite too, Tommy Hearns. There’s a real appeal to Prograis. He grabs the attention of everyone in the same way the boxers of the past did so masterfully. My son and I discovered Prograis while flipping through the channels one night. I immediately was drawn to his style that harkens back to the exciting 1980s. My son loved the the Rougarou shtick. There’s almost a pro wrestling element to the way Prograis enters the ring. That’s a good thing for today’s potential fan. If boxing wants new blood watching, they need to present characters. Prograis has that covered. He has a persona and then backs it all up when the bell rings. Now 29 years old, Prograis left his hometown as a teenager because his family felt Houston, Texas was a better breeding ground for up and coming boxers. But his love for the Big Easy runs deep. He wears Saints colors and a big fleur de lis on his robe. 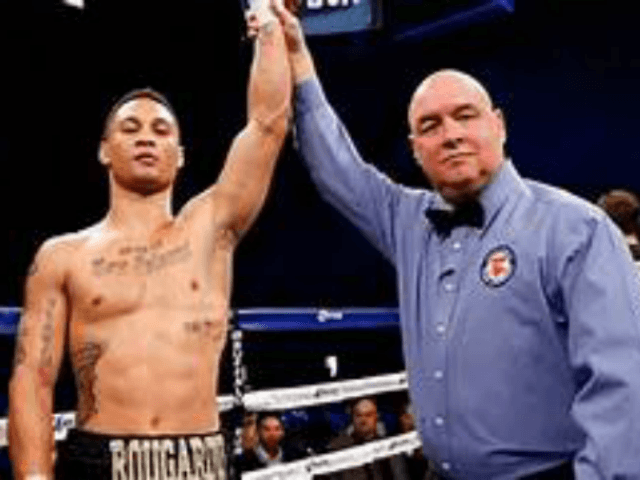 Prograis is New Orleans as much as he is the Rougarou. Now he wants to become the city’s first major boxing champion in over a half a century. On Friday Prograis and Indongo will collide for the vacant WBC interim junior welterweight belt in Deadwood, South Dakota. The Rougarou will be far from Louisiana but New Orleans will be on his mind and in his heart with every punch thrown. New Orleans will also be on Rougarou’s chest, but that’s always the case. The city’s skyline is tattooed there. There’s no question who this man fights for. Prograis contends that New Orleans needs a hero. He acknowledges the city has pro sports stars like Brees and the Brow, plus famous entertainers, but he wants kids to see a superstar boxer. He wants them to know they can do it too, even if they have to overcome obstacles. Prograis knows firsthand what it takes to rise from the ashes, or in his case the waters. His family had to evacuate after Hurricane Katrina hit. Just 16 at the time, Prograis learned he had to fight in life. He channeled the feelings he had about Katrina and used them to become a better boxer. He headed to Savannah Boxing Club in Texas and began to shine. Prograis started to excel not only in the ring but outside of it as well. He met his wife in Houston and today they have two beautiful children. The Rougarou suffered through a historic storm only to come out of it stronger than ever. The signature win for Prograis thus far was his impressive knockout of Joel Diaz Jr. in the second round. Now Indongo stands in the southpaw’s way. Indongo best beware. Prograis is not your point scoring, dancing around, defensive fighter we’ve become accustomed to in recent years. He is a stalker. An attacker. He is all about offense. He is all about punishment. Friday, years of dedication and hard work will be on display as a true fighter’s fighter attempts to make a dream come true. Get ready, New Orleans. Get ready, America. Get ready, world. There’s a werewolf-like creature from the Louisiana bayous on the loose and he’s not about to be tamed. His name is Regis Prograis and he’s out for blood. He’s the Rougarou, the best thing that’s happened to boxing in quite some time.